76ers guard Allen Iverson and head coach Maurice Cheeks on the sideline during the 2005-06 season. One of the NBA's most underrated players has finally received the honor he deserves. 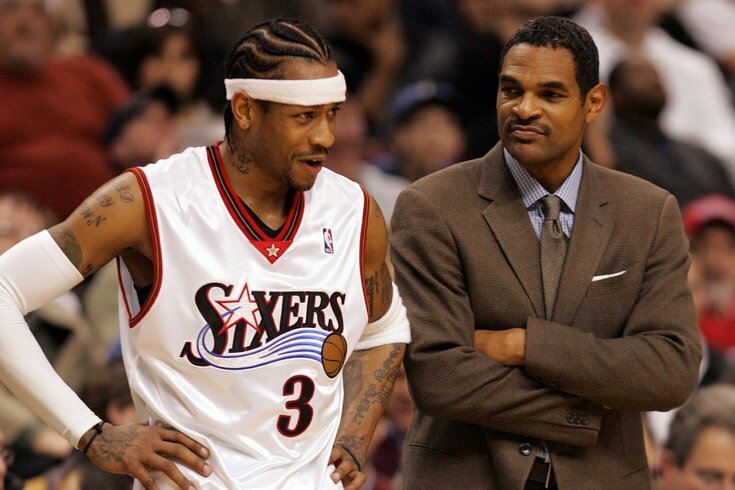 Maurice Cheeks, the point guard for Philadelphia's last title team and a steady hand for the Sixers over 11 seasons, has reportedly been selected for induction by the Naismith Basketball Hall of Fame, according to ESPN's Adrian Wojnarowski. It has been a long time coming for Cheeks, whose list of accomplishments in the NBA is more impressive than you might remember. Named to four All-Star teams and selected to the All-Defensive 1st Team on four separate occasions, Cheeks' brand of basketball was that of the quintessential point guard. He made life miserable for the opponent on one end and worked tirelessly to set up his teammates on the other. Those qualities seem obvious in retrospect when you look at the stats he piled up before calling it quits in 1993. At the time of his retirement, Cheeks was the NBA's all-time leader in steals and ranked fifth in assists, all while shooting greater than 52 percent from the floor. He still ranks inside the top-15 in both of the former categories despite 25 years and a lot of changes to the NBA going by. Billy Cunningham, who coached Cheeks for eight seasons in Philadelphia, cited Cheeks' unselfishness as a driving force behind the team's success in the 1980's. "Accolades were nothing he looked for or wanted. As a matter of fact, he felt very uncomfortable in those type of positions," Cunningham told The Oklahoman. "When he stepped on the court, he couldn't care less if he scored a point, 20, whatever it was, as long as he won the ggame. That turned our franchise around when we got Maurice Cheeks and Bobby Jones because of the type of players they were. They weren't concerned with anything but winning." Cunningham wasn't lying — Cheeks' teams had a career 633-377 record during his 15 years in the league, and he only missed the playoffs once as a starting point guard. While his exploits in Philadelphia have always been appreciated locally, Cheeks combination of talent and class also endeared him to members of the media outside of the city. Bob Ryan, the legendary Boston Globe writer who covered the NBA for a span of 40+ years, gave an impassioned case for Cheeks during a segment on ESPN's Around the Horn in March. "The Basketball Hall of Fame is incomplete and it will remain incomplete because they have not seen it fit to nominate the perfect point guard," said Ryan. "The best man not in the Hall of Fame is Maurice Cheeks." It's only fitting, then, for Cheeks to be honored alongside a class of top-notch guards. Cheeks will join Jason Kidd and Steve Nash in the 2018 class, two guards whose distinct styles helped define and change the game over the last couple decades. Former Duke and Detriot Pistons star Grant Hill will also be a part of the class, according to Wojnarowski. There's no higher individual honor in basketball than this, and though it may have taken 25 years following his retirement, it appears Cheeks finally got the assist he needed.